It is for the first time, the inventor and chief ETG AyurvedaScan Investigator of Ayurveda High diagnostics technology ”E.T.G. AyurvedaScan” has identified some chemical substances, who can represent to Ayurveda Fundamentals VATA, PITTA and KAPPHA, three tridosha and SAPT [SEVEN] DHATU detection in human body by examining Blood serum SAMPLE by the help of COLORIMETER based result studies. Since ten years, Dr DBBAJPAI is doing work on the line of chemical chemistry at his own established laboratory for the patient coming for the treatment of AYURVEDA and AYUSH on the basis of the findings of ETG AyurvedaScan exminations and other related tests so far. These tests are confirmatory in sense of the pathophysiology to pathology presentation of the disorders, which patient have in broader sense for diagnosis as pin pointed as possible. These studies are helpful in selection of remedies for individual patient and to suggest the right life style adaptations. COLORIMETER ON WHICH BLOOD SERUM AND SEROLOGICAL TESTS ARE DONE. SEROLOGICAL TESTS ARE BEING DONE ON THIS COLORIMETER BY DR. D.B.BAJPAI IN HIS ESTABLISHED LABORATORY FOR ASSESSING AYURVEDA FUNDAMENTALS AND DIAGNOSIS OF DISORDERS IN VIEW OF AYURVEDA. OTHER CHEMICALS USES IN COLORIMETRIC TEST. Dr DBBajpai have established his own clinical pathology laboratory before 45 years to help the patient and to verify the report of ETG AyurvedaScan for patient only. Later he got a vision that by Blood serum and by Urine Ayurveda fundamentals can be quantifies by Blood serum using some chemical substances before 12 years. He started to examine some chemicals, which was very near to the concept of Vata and Pitta and Kapha. Later on he found some chemicals, which are very near to the Sapata Dhatu concept of Ayurveda and thus 10 parameters are established by examining Blood serum and urine of the patient. In COLORIMETRIC Analysis , assays are tested by using filters for Vata and Pitta and Kappha. The technique is very simple and any colorimeter or spectrophotometer technician can do the test in laboratory. Working solution is poured in required quantity in Quvet and blank reading is set up to zero, after that 20 ul centrifuged blood serum of patient is mixed with the working solution. After two to ten minutes interval, the reading is recorded and is multiplied by 1000. The abbreviation is used tvv/L that means “TOTAL VATA Value per liter” for example Colorimeter reads Vata assay 0.12, this number is multiplied by 1000 and after calculation the number comes 150, that means the presence of Vata in patient is 120 tvv/L. The normal value is 90 to 125 tvv/L as is established by me. The obtained reading is within normal limit and that means VATA DOSHA is in normal in patient. After going through the long period examinations of large numbers of the patient, NORMAL levels of the AYURVEDA FUNDAMENTALS like TRIDOSHA and SAPT DHATU are been established. 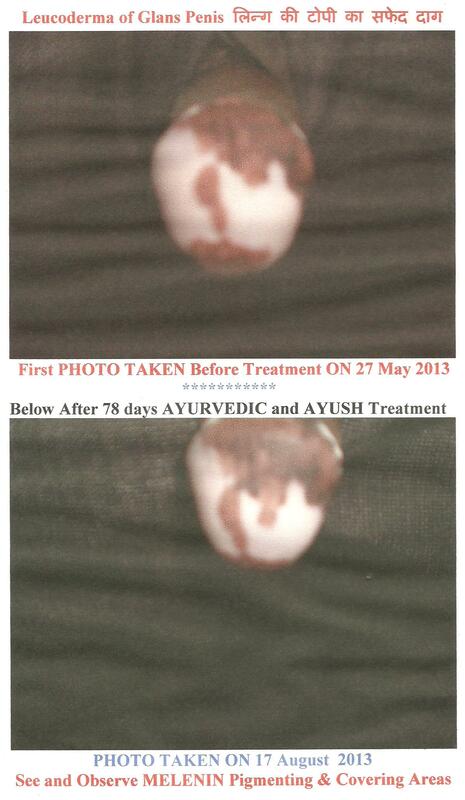 Counter checks are done always comparing with the reports of the ETG AYURVEDASCAN findings. Now the results are helpful in finding the type of Doshas and its combination to help patient in treatmetn and management of the case. After treatment the repeated examination of blood serum of patient can give a best indications that where and how much he got progress in his ailments. A comparative sturdy can ensure the benefit of the Ayurveda and AYUSH treatment. YOGA DIVAS ; this is the third year 2017 of Yoga Divas nd is being celebrated all over the world and globally. During the interviews of Patients from overseas visited at our research center accepted the facts that in India it is a privilege that some alternative treatment and complementary therapies are in practice in India for example Ayurveda / Homoeopathy / Unani / Yoga / Nature-cure and others like Sidhdha and others. But in their countries , this facility is not possible. In some countries Homoeopathy is banned due to obvious and un-known reasons. Therefore the complaints which are treatable well by Ayurveda / Homoeopathy / Unani and other systems , can not be supported by these therapies and as a result peoples in majority are suffering very badly due to not having any alternative means of the treatment and diagnosis as it is easily available in India as a specialization way of the treatment. Human body if seen anatomically , major systems are skeletal, then tendons, ligaments , cartilages , muscles makes a group of muscular system, then comes Autonomic Nervous system, which carries signals from mind to some organs and the Circulatory system for flowing the blood over all to body. In yoga this combination of the system works in major share. Thus it can be said that Neuro-musculo-skeletal systems are the major share holder of the YOGA exercises. Flexion of the joints of the body are a center point of Yoga Postures. Contractions and relaxations practice causes well flow of fresh Oxygenated Blood the muscles and of-course to the joints and thus nourishes these parts by reaching ELECTROLYTES and MINERALS and essential nutrients supplied by the SPLEEN and LIVER to cover the damages in the parts due to daily hard work done by Human body. PRANAYAM are beneficial for Lungs. As much as air inhalation is beneficial for Lungs and Lungs exercises including Laryngo-pharyngo-tracheal parts and Chest and Chest-Back muscles and ribs. Air contains Nitrogen gas, Oxygen gas, Carbon di-oxide gas , ozone gas and many others. Inhalation of these gases as much as possible make strong the parts of body which requires these gases for metabolic requirements. During sick condition, YOGA with AYURVEDA in INCURABLE DISEASE CONDITION , combined treatment helps to maintain the body near to normal level. Caution should be taken for those persons, who have exhausting disease conditions, like Cardiac problems / Cancer of various parts / loss of blood / enlarged liver / kidney disorders / Pulmonary disorders and other fatal conditions, where vigorous exercises are prohibited, should take great care before starting of Yoga practices. Yoga is not advisable to those who are very weak physically. For all humans and for all physical disorders, PRANAYAM is advisable because this safe and will not harm in anyway. Simple Pranayam like Anulom vilom is quite sufficient for all ages and can be practiced in morning or in evening. Only Anulom and Vilom Prabayam ecercises most of the parts like larynx, pharynx, trachea, nasal passage, sinus, lungs and chest muscles of front chest and cage, diaphragm, Liver. stomach, spleen and upper and lower digestive tract. Those persons who are not strong and weak should practice Anulom and Vilom Pranaayam from one or two pranayam paerday and later increase the frequency of exercise. Physiological studies about YOGA is only seen in Dr. A.K.Jain’s book ”TEXT BOOK OF HUMAN PHYSIOLOGY” and I have quoted and loaded matter in 2015 YOGA DIVAS, readers can see the scientific aspect of Yoga. In our research center, we are studying the effect of Yoga on human beings on the line of the findings of the latest Ayurveda hi-tech E.T.G. AyurvedaScan and other laboratory examinations. Care should be taken during the Yoga practice and in problem should consult a physician when feel any uneasiness. YOGA and AYURVEDA combination treatment should be taken under strict supervision of an expert Ayurvedicians and time to time advise should be taken with the progress of the health condition. Anyone should not try YOGA and AYURVEDA treatment alone and by himself. This can be dangerous to health and may damage seriously the parts. So care is necessary as a precautions. INTRODUCTION TO E.T.G. AYURVEDASCAN TECHNOLOGY ; IN HINDI LANGUAGE ; FREE BOOK DOWNLOAD ; FIND THE LINK TO SLIDESHARE.COM/DRDBBAJPAI ; ई०टी०जी० आयुर्वेदास्कैन टेक्नोलाजी का परिचय, पुस्तक का हिदी सन्स्करण इन्टर्नेट पर मुफ्त मे उपलब्ध है ; जानिये आयुर्वेद की आधुनिक हाई टेक्नोलाजी ई०टी०जी० आयुर्वेदास्कैन टेक्नोलाजी के बारे मे विस्तार से कि यह क्या है ? LONG AWAITED BOOK ON THE INTRODUCTION OF E.T.G. AYURVEDASCAN TECHNOLOGY ; is now available free on internet. The internet edition can be downloaded free of cost from the following given link. So many requests from the Ayurveda lovers to know about the E.T.G. AyurvedaScan Technology as a primary as well as advance level introduction desired by the practitioners. Although much have been published about the technology in Ayurveda journals about the technology along with publication of research papers in Ayuveda Journals and several magazines. It is felt by me that majority of Ayurvedic doctors and Ayurveda lovers do not know even the least about the ETG AyurvedaScan technology, so therefore it is a difficult task to understand the technology for them. Narration about the technology to each and every one is a difficult job for me, therefore I thought to write a small book as a introductory material for all and for those who can use it. Thjs book is in HINDI LANGUAGE and contains the essential information about E.T.G. AyurvedaScan and its procedures and theory and practices. This book is a first attempt to give the information and technique of the technology in a place.